Today I'm sharing this look that's very much inspired by the cali-girl that lives in me! It's no secret that I've always felt like there's something out in the west coast for me, ever since my senior year of high school I've been dying to live out there. But for now this quick and easy boho-glam 'fit will have to do. 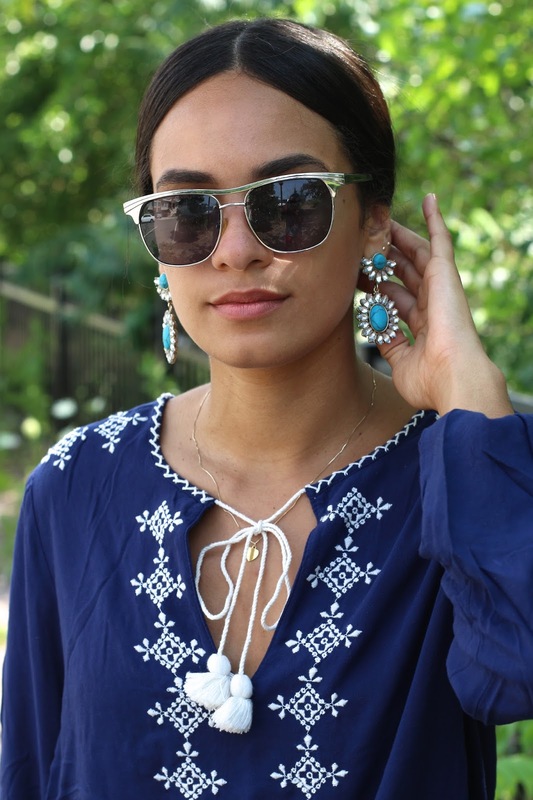 I'm a fan of mixing statement pieces like these glamed up earrings or this boho blouse with more easy going ones like my go-to boyfriend shorts. I think it works well for different occasions/activities, like a chill afternoon walking the high-line to then meeting friends for a cocktail or two. And since being a Queens girl has trained me to leave my house prepared for whatever comes up and dressed for it all, I've had to make these looks my standard as of late. Since we're on the subject already, let's talk about mixing high and low. I know this is what street-style photographers go bananas for: gals that can work a look that isn't head to toe prada right? Well I think I took the art of mixing to the extreme this time as I found my sandals at no other than payless! Yes, you read that correctly. And I know these puppies won't last me more than 2 summers max but hey, they're on trend and only cost me 12 bucks! how can you beat that?